After the Council of Trent and its reformation of the Church’s l liturgy, the central role of the altar with tabernacle in its centre j was accentuated. The main altar was placed in the liturgical and j artistic centre of the shrine. It was to symbolize the throne of l Christ in a holy place, Sancta Sanctorum, the place where God| is present. The cathedral altar boasts quite unique composition in-spired by the tract of A. Pozza (1642-1709), (fig. 45). Johann Riedel SJ (1654-1736) worked on the altar for four years (1690-1694). 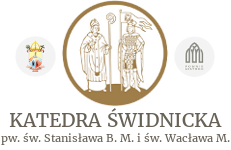 Świdnica attracted many artists and craftsmen. After 1692, fabrica Ecdesiae was created at the church. It was directed by Johann Riedel (1654-1736) who had been working there for 44 years. The altar was built on the circular plan. It is supported on l seven pillars and raised on high pedestal. The antependium decorated with bas-reliefs pictures the Lamb of God on the altar | of burnt sacrifice and symbols of Eucharist. The altar refers to biblical citation from the Book of Prov-1 erbs, 9:1: “Wisdom hath builded her house, she hath hewn out her seven pillars (…)” (King James Yersion). Dark composite columns arę entwined with bands of gold rosę leaves. There l is a circular baldachin over the altar surmounted by an open-work dome. Baldachin was usually placed over the royal throne. In church, it serves symbolic role – it imbues the space below with transcendental meaning. The baldachins frieze depicts a pelican feeding the young as well as eagles with vine branches. Symbols of Eucharist. The central part of the tabernacle depicts Yirgin Mary Cmeen of Heaven with baby Jesus. Notice symbol of the Holy Ghost over Jesus. The whole is surmounted by the figurę of God surrounded by little cherubim with attributes of the Holy Trinity. Next to Yirgin Mary you will find figures of the patrons of the church: Saint Stanislaus the Bishop and Saint Vaclav. Between the columns you will find figures of Ignatius of Loyola and Saint Francis Xavier. The altar is flanked by statues of Saint Florian and Saint George. On both sides of the chancel were placed plaąues with his-tory of the church. 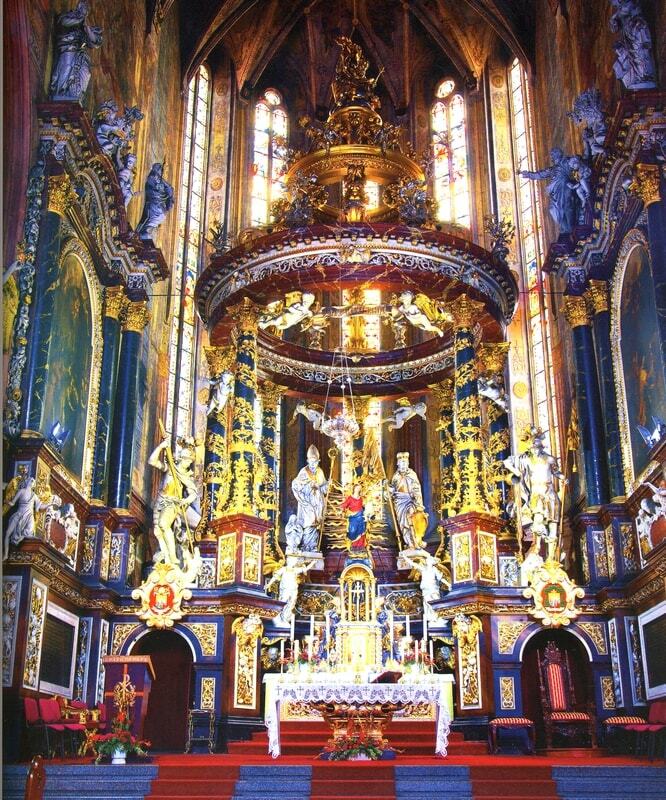 Over the plaąues, there arę paintings in archi-tectonic frames resembling an altar screen, flanked by columns with depictions of the “Martyrdom of Saint Vaclav” by Michael Willmann and the “Martyrdom of St. Stanislaus the Bishop by Jeremias Knechtel (1706). Above the paintings, there arę illusionist polychromes of J.G. Etgens depicting open sky wit angels holding attributes of saints as well as palms of victory and wreaths of eternal life. Ali with monumental architectur in the background.